Terrorists and dictators have long used violence to blackmail democratic governments. Now they're doing the same against magazines and movie studios. There is still much we don’t know about both last year’s cyberattack on Sony and Wednesday’s attack on the French satirical magazine Charlie Hebdo. Some security experts question whether North Korea was really behind the former. We don’t know whether the latter involved lone-wolf attackers or an organization like ISIS or al-Qaeda in Yemen. But if current narratives hold, the parallels between the two attacks are striking. In both cases, media in the democratic West poked fun at subjects that totalitarians consider sacred. And in both cases, those totalitarians took revenge not against the governments that permitted the satire but against the satirists themselves. It’s a terrifying and fascinating evolution in war. After 9/11, Americans often said that in the “war on terror,” America faced a different enemy than in past conflicts. Instead of a state, the U.S. government was now fighting a terrorist network that operated within many countries but formally governed none. But the Sony and Charlie Hebdo attacks flip that paradigm around. Instead of redefining the enemies we fight, they redefine who among us is doing the fighting. In last year’s struggle with North Korea, America’s primary combatant was an entertainment company. In France today, the primary combatant is a humor magazine. This time, the shift to non-state actors is occurring within the United States and other Western countries. Governments are obviously not irrelevant to this new phase of conflict. The U.S. military appears to have retaliated against North Korea on Sony’s behalf. The American and French militaries battle ISIS and other violent jihadist groups around the world. And American and French law enforcement are charged with finding the perpetrators of the Sony and Charlie Hebdo attacks and preventing similar assaults in the future. But because these assaults aim to intimidate movie studios and journalists, their impact cannot be measured merely by how governments respond. Historically, terrorists and dictators have often used violence to blackmail democratic governments into changing policy. Now they are using violence to blackmail editors and studio heads into doing so. Which means that journalists and media executives, rather than merely politicians, must choose either appeasement or defiance. By first refusing to disseminate The Interview, and then agreeing to, Sony pivoted from the former to the latter. With most of its staff murdered, Charlie Hebdo itself may, tragically, not have the choice. But in deciding whether to show the images that seem to have gotten Charlie Hebdo’s cartoonists and editors killed, countless other magazines, newspapers, websites, and television networks will be acting as either hawks or doves. Journalists and media executives understandably resist seeing themselves as agents of American (or French) foreign policy. They pride themselves on their independence from, and opposition to, all state power. In 1970, Charlie Hebdo, which then went by a different name, was banned for mocking the death of former French President Charles de Gaulle. But like it or not, writers and film producers in America and Europe are now participants in a cultural struggle that, while different from the military and diplomatic struggles being waged by their governments, runs parallel to it. And as a result, they must consider not merely how publishing a given book, movie, or cartoon affects their company’s reputation and bottom line, but how it affects the struggle to preserve open societies against totalitarian pressure. 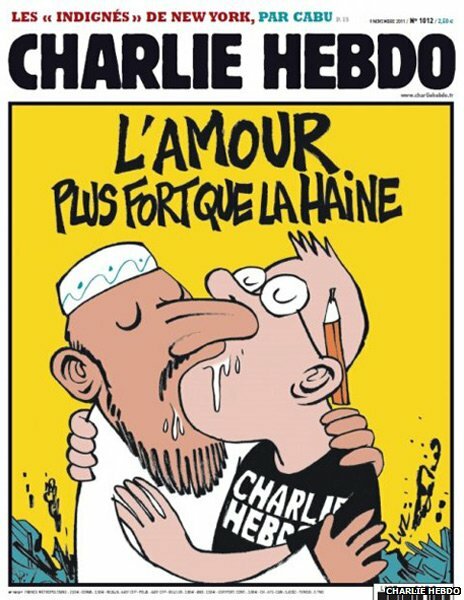 In 2011, only six days after its offices were firebombed in retaliation for images mocking the Prophet Mohammed, the cover of Charlie Hebdo featured one of its male cartoonists kissing a bearded Muslim man under the headline, “Love is Stronger Than Hate.” Tomorrow, in Charlie Hebdo’s honor, and as a mark of resolve in the cultural struggle in which its staff lost their lives, newspapers around the world should put that cartoon on their front pages.